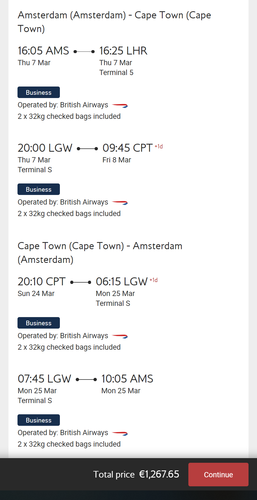 British Airways is offering some very aggressive fares out of Amsterdam if you fancy a break in Cape Town or Johannesburg in 2019. However … in reality you are going to struggle to find availability early in 2019. Your best chance is later on, when the weather is not so good. It can be done though – here is an example for March. If you can make the dates work, this is a good deal. Remember that, as the stopover in London can be for up to 24 hours, nothing stops you flying to Amsterdam, coming back late in the evening, going home (if you’re London based) and then heading back to Heathrow or Gatwick the next day for the long-haul leg. 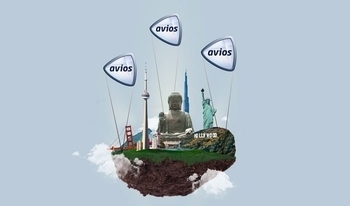 A quick reminder that the current offer for 50% bonus Avios when you buy or gift points ends on Sunday. This is not necessarily a great idea as the best value is generally obtained by buying a small number of Avios to top off your account. If you saw me on BBC1’s Rip Off Britain earlier this year (you can watch the segment here, it is only 3 minutes long) you will know that one of the members of the public I tried to help had bought 100,000 Avios for £1,600 without fully understand the restrictions behind them. HFP readers should be more switched on, however. Cathay Pacific has launched a new partnership with AirPortr, the luggage collection and delivery service. Cathay Pacific customers from Heathrow or Gatwick can now arrange for their luggage to be picked up at their home or office and checked in for their flight on their behalf. This allows you to head straight through airport security on departure without having to queue to check your bags. Arriving at Heathrow or Gatwick, passengers can arrange for their bags to be picked up at the airport and delivered directly to their home, hotel or office. You can book here. The first bag costs £30, collection of up to four bags costs £40. You can read a review of AirPortr’s service here. AirPortr offers a similar service to British Airways customers at Heathrow and Gatwick, American Airlines and Finnair customers at Heathrow as well as easyJet customers flying from Gatwick or Luton. Virgin Atlantic is due to be added as a partner soon. What are the repercussions of missing the last leg of the flight back to Amsterdam? Could I just you home? Technically no, and you run the risk of BA repricing the ticket and requesting the difference. And unless you have a change in UK airport your bags will be checked through. As a one off, probably yes. With the Heathrow to Gatwick changeover you’ll get your bags back, so you could easily just ‘miss’ the last flight. We’ve done it a couple of times. It’s not recommended on a regular basis but once or twice and nobody will say a word. BKK is sort of on permanent sale from AMS. BA’s 772 is crap, but can be avoided by routing via HKG which is still valid for the fare. A German local court recently ruled that LH could not charge a passenger extra for not flying his full ticket. With BA I expect the risk to be more that Avios and TPs are retracted and/or BAEC account closed, if anything, but I haven’t heard of this happening yet. I usually use the LON-AMS flight for a European trip. Obviously not everyone wants to have another Europe trip right after a Bangkok one, but by paying the £26 APD you can usually schedule the final flight for a (much) later date. Why not choose a date for the LGW-AMS leg that is some time in the future? You could even get a very cheap weekend away in AMS. Of course, if you were brave enough, you could just buy the ticket, ditch the AMS bit and just hop on in London……certainly looks like this will be possible shortly. Dc, l would say just go home. It takes a hard neck but very doable. We had flights back to Dub from into LHR to out from LCY. As my OH had “a meeting in the city” that day. Sudden “severe delays on the tube” meant we couldn’t make our flight back to Dub. It was at the end of an ex Eu BA dub trip in J to NYC. Booked direct tho. And we had checked in. Same goes for severe traffic on the M25 whilst transferring from LHR to LGW and vice versa. As mentioned, if you booked through a travel agent, then please don’t risk it. One TA got very badly stung when some pax didn’t complete last legs, and were then charged up by the airline. Serious repercussions for the TA, not for the many pax tho. Always try to price up the flight as an open jaw ending in LON, because most of the time i do this the price is identical or less than a return back to the origin, with no risk of annoying anyone. Doesn’t work all the time of course. You are correct, often it’s only £100 more are the most…we should have mentioned that sooner, completely forgot that point. On our nyc return, it was £100s more to come back direct to Lon tho. So no choice. Lucky my OH “meeting” over ran in the city tho. So we just had to come home…. The buying Avios with 50% bonus got me thinking…. Been pricing up options for connecting/domestic flights for Oz/NZ, intead of a full Avios redemption, if you choose to reduce the Avios amount by increasing cash you are often “buying” Avios at the rate of 0.75p/Avios. If you are in a similar situation, (maybe for flights within the US also??) it’s well worth considering rather than buying them in this promo. It depends on the cash price – there are some very expensive Caribbean destinations which would make it a good deal. Yes, l just did this yesterday. Instead of an RFS from DUB, needed my last 5 TPS to retain Silver. Used just 2500 avios to bring the HBO down to €15.50 one way. Problem solved. But very useful way of buying or using avios, even on a route where RFS is good. Yes, Harry, a reminder article on this would be useful. But l think there was one done fairly recently IIRC. Yes, realised that after l had posted. But definitely good point, and worth advising people to look at all angles. Yes, esp useful, if needing final BA sector for status retention, and the final few TPs. So avios + money qualifies for avios and TP? AFAIK Airportr with Virgin is already live rather than coming soon. A dummy booking at Airportr certainly suggests so. Some of their programming is not quite there – last time I used them when flying Easyjet, the screens where I had to click agree on their handheld device said “My baggage complies with American Airlines baggage policies” ! But they have always delivered my bags as promised. OT but BA – does anyone know when the 2020 off/peak calendar for 2020 redemptions comes out? My son has a very late Easter holiday that year so I’m hoping to bag an award seat bargain like for 2019 when his Easter holiday is very early! Try searching HfP for when the chart for 2019 came out to give you an idea of when the 2020 will be. Hmm, it was June which is a bit late for anyone travelling in the first half of the year and needing to book early! Yes but knowing in advance helps you know how many avios you’re going to need to amass, it’s a substantial difference. Please can someone explain why the AMS-LON-CPT fare is so cheap? Is BA trying to get us to buy tickets to from LON to AMS? Or is it merely trying to entice travellers from KLM? And would anyone really fly AMS-LHR-LGW-CPT if you were already in AMS and knew what the M25 is like? However cheap the fare. Most likely they are struggling to get people to travel from AMS on their flights so pricing them cheap. Peter, we would do it, and in fact will at some point in the future. In a sale, of course. Serious savings, if it’s somewhere on the wishlist. We would schedule our AMS LHR flight to come in the night before, so sleep at home. Then go next day to LGW at our leisure. Once the stopover is within 24 hours of landing and taking off. It’s definitely workable. But only if you have easy access to these airports. And yes, they want to poach the direct paying travellers from KLM, as from all major hubs, as Catalan says. Of course we would…..we invariably fly Business ex AMS, CDG or MAD, dependant on carrier/destination. As long as we continue to be ripped off with UK taxes, just for leaving the UK then a European departure suits us fine. And a shame it’s not the direct Durban flight. Well – I have booked AMS to CPT retrun out Jan 10 back Jan 22 for Euro 1267.86 plusof course to – from AMS from London foranother £113.44. Cape Town Hotels are also cheaper at this time than later in the year so a good deal all round. haha – my 3 will be 14, 16, 18 within 2 months – we’re getting there!